Where’s This Bunker & What’s This All About?? Let’s Get Ready To Ruuumble! What 10 TV shows and movies will you take underground to ride out the zombie apocalypse? The big day is here. All final nominations must be in for all Bunker Community Members. In the season 1 finale (episode 8) of Death In Paradise starring alongside Ben Miller we have… (drumroll please) … Danny Webb!! Just some of Dannys prior work includes Valkyrie, Alien 3, Sherlock, Endeavour, Being Human, Hustle, New Tricks, Doctor Who, Heartbeat and Waking The Dead to name just a few. Episode Synopsis: Dwayne ends up embroiled in a murder investigation when a piece of incriminating evidence is found at the scene of the crime. Can Richard solve the case and meet a deadline that means he will finally get what he wants – a return home? Hello Clare “Dr. Laura Hobson” Holman! 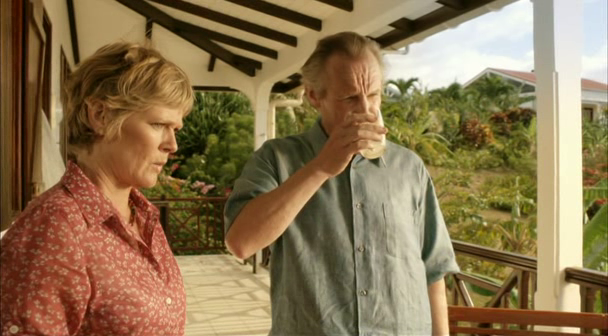 Whilst we would never dare to compare the skills of Detective Lewis and DI Poole, it was lovely to see Clare Holman guest starring on Death In Paradise in season 1 with Ben Miller. Of course Clare Holman’s repertoire is wider than just being Dr. Laura Hobson, Clare has also been seen in The Bill, The Lakes, Silent Witness, Island At War, Eleventh Hour, New Tricks, Blood Diamond & Heartbeat. Episode Synopsis: When a woman not only predicts her own murder but also gives a description of the murderer, it all feels too easy for DI Richard Poole. Can a case from the past help solve the present day murder? And more importantly, can Richard convince the team that it has nothing to do with voodoo spirits?